The past couple of weeks have been a roller coaster of emotions. Wanting the world to know how amazing Manda was. Wanting to honor her memory in a lasting way. Wanting to help others going through the same things she went through. A #mandastrong foundation? When's the first meeting. After tossing around dozens of ideas, we decided to start off by sending a little love to 10 women currently going through cancer treatment in the form of blardigans. If there's anything I've learned over the past few years it's that sometimes the small gestures mean the most. An encouraging text, a well-timed meal, a thoughtful gift all go a long way in showing someone you love how much you care about them when. So today, Sheaffer, Erika, Shay, Narci and I are selecting women who are currently battling cancer and sending them a blardigan of their choice. All you have to do is leave a comment on any of our blogs and either nominate yourself or a friend and that's your entry. Simple and easy. Ten random entires will be selected and we'll announce the recipients on Friday. I shared this video last week, but I wanted to share it again today in case you missed it. Hearing Manda tell her story and talk about her faith is powerful and moving and full of home and encouragement. and if you're looking for a way to support her family you can donate on her Gofundme page HERE and/or order a new Mandastrong shirt HERE. Again - thank you from the bottom of my heart for the love, prayers and support. Last Friday was Kite Day at school (for elementary) and while it was cold and foggy the boys had a blast! Dave was able to go and watch and I was so happy because I was deep in the throes of tests, grading and report cards. Thankfully I got it all done and have my Spring Break work-free! ... and then headed home where we spent a few hours outside playing and doing science experiments. Saturday morning Griffin was asked to be part of a little photo shoot at Playstreet Museum so she and I headed there bright and early. She is OBSESSED with Playstreet and had the absolute best time playing. I'm not even sure she realized she was part of a photo shoot. Changed back into her clothes and ready to go! I was checking out at Hanna Andersson and caught her "trying on" Minnie pajamas in the mirror. Cutest. Thing. Ever. ... and then yard work for everyone! Sunday was CHILLY, but we braved the cold and headed to the golf course for some exploring. She kept pulling her hat down to "keep her eyes warm"
Perfect end to our weekend! Love honoring Manda with you today! Such a fun weekend - loving all the houseplants! I would like to nominate my aunt Marlene. She is now battling cancer for the third time. She was diagnosed with breast cancer 25 years ago. She fought it, did her treatments and got a clean bill of health. Theee years ago it came back and she fought it again. The treatments made her so com but she never gave up She completed her treatment again and was given a clean bill of health. We were so happy. Then a few months ago we got the call, it was back for a third time and spread to her liver, it was terminal. She is unable to do chemo or radiation this time and is currently on a trial treatment. She is in pain daily but she still is fighting and her spirits remain high. She is so strong and such an inspiration and I can't think of anyone who would deserve a little something special more than her. She is truly remarkable. Kimm, I'm so sorry to hear about Marlene. She sounds like an incredibly strong woman! Prayers for continued strength and for her spirits to remain high. Andrea, I'd like to nominate one of my best friends, Barb Hines. Almost two years ago she was diagnosed with multiple myeloma. This cancer has no cure. A year ago October she went through a bone marrow transplant, just to extend her lifespan to 10-15 years. This is the same cancer Tom Brokaw has. There is no cure and as of now the doctors expect the cancer to come back in full force at some point. She's an amazing mom to 3 children and never ever complained once about her diagnosis. Barb sounds incredible! My grandfather had multiple myeloma - so I'm familiar with what that diagnosis looks like. Praying for her to have lots of good years with her family! I love this way to give in honor of Manda. Looks like your spring break is off to a fantastic start! thank you! It's definitely a great way to start honoring her memory. I nominate Ashley Moore who is currently battling cancer. My Mom is currently battling leukemia. My Dad was diagnosed with colon cancer in April 2014. We lost him in March 2015. My Mom started getting sick a few months later. And received her diagnosis in September 2016. It has been a tough road. But my Mom is a fighter. So glad I have her. So honored to take care of my parents during this stage of life. I'm only in my 30s...so it's hard to see my parents like this. They were always my rocks. But my Mom has such strong faith. On the days, when I feel like I can't go anymore...God is holding us up. Sending me words of encouragement. Giving my Mom strength. Your statement about it being an honor to care for your parents brought me to tears. You are amazing!! Praying for your mom! I would love to nominate my aunt Mary Brth who is going though treatment for Ovarian cancer. Thanks! I would love to win a blardigan for my aunt Jill (Gigi) who is courageously battling Pancreatic cancer. Thank you! I nominate my sweet friend A, who was diagnosed last month with thyroid cancer...and is pregnant with their first baby. There's no fighter as strong as a mom! I would love to nominate my mother in law. She is at the beginning of this journey and could so use a happy to give her a boost. She has two boys and and one grandbaby...and one on the way. This diagnosis has understandably knocked the breath out of us all but what better way for us to wrap around her...than to literally wrap something around her. Exactly!!! I feel like a blardigan is the next best thing to an actual hug ;) prayers for your MIL! I would like to nominate my friend Leslie who is currently going through treatment for Thyroid cancer. Thank you for offering such a thoughtful giveaway! I would love to nominate my mom, Kathy, who was diagnosed with breast cancer two weeks ago. I know the blardigan would bring a smile to her face and comfort as she begins treatment! Claire, prayers for both of y'all! Hey! I would like to nominate my cousin Nona. She was diagnosed with breast cancer late last year and just went through surgery for full mastectomy. It's been so hard on her confidence but she is such a strong woman and is pushing through for her family! I know she would appreciate such s sweet gesture. Thank you. Nothing beats strength from family! Praying for Nona! Love this giveaway! 💜💜 And Griffin and her unicorn are too cute!! That's AMAZING!!!! Praying for Stephanie! I would love to nominate my friend Alisha. While she isn't battling cancer, her 3 year old son is. In November they discovered a tumor on his spine that is rare! He is currently undergoing chemo treatments weekly and at this point they aren't sure what long term is going to look like. She recently just made the tough decision to walk away from a job that she dearly loved to be home with her two boys. This family has had a TOUGH couple of months and I would just beg of you to consider this for her. She could really use a little pick me up and I just know that it wouldn't go unappreciated. You girls are the best to be thinking of others and I'm sure this would make Manda PROUD!!!! You ladies have such amazing hearts. I would love to nominate a dear family friend, Scherrie. I agree that the blardigan is the perfect item to bring to chemo. This is the sweetest idea! My friend,Carmen McRae, is currently fighting breast cancer. She is currently in the middle of 6 rounds of chemo and then she will have surgery and radiation. I would love to be able to gift her with a blardigan in honor of your sweet Manda. Prayers for Carmen and the road ahead of her! I would like to nominate my friend, Kristin, who is battling Leukemia. She is an amazing wife, mother, sister, and friend. She had a bone marrow transplant in January and I know she would love to have a blardigan to wrap her in love and comfort while she is recovering. Thanks, Lauren! Praying for Kristin! I am nominating my sister in law Allyson, she is battling statge four melanoma that has spread throughout her entire body. She is brave and always so upbeat and I would love to surprise her with this. Praying for Allyson and for her upbeat spirit ;) so inspiring! I nominate my friend Becca. She is currently in treatment for breast cancer. I think a blardigan would be so cozy and comforting for her. Great idea! My mom, Wendi, was just recently diagnosed with breast cancer. She is currently planning on either doing radiation and surgery or radiation and a single or double mastectomy after she receives results from her genetic testing. She is the strongest woman I know and my best friend. Prayers for her and for all the women battling cancer. I nominate my sweet, sweet friend, Carrie. I met her through a friend in our community, but thanks to life we have become real friends. She is such a sweet and caring friend. Always welcoming guests for Shabbat dinner and helping with things in the community. Unfortunately after beating cancer she is currently going through her 2nd round of chemo. :( Prayers to all of our loved ones going through such a horrible battle. I would like to nominate my friend Heidi who is going through treatment right now for cancer. She is so brave and would love to see her receive a blardigan. I'd like to nominate my husband's aunt Jane. She's in the middle of chemo treatments now and was diagnosed shortly after both her sons each had their first children. So she has two brand new granddaughters and she's strong as can be and wants to fight for them. She can't wait to spend time with them. I'd love her to win this blardigan! Prayers for all fighting and all their loved ones. My friend Aimee is just beginning her battle with Non-Hodgkins Lymphoma. She is a mother to three young children and also suffers from rheumatoid arthritis. I nominate Merilee Valentine who is staying strong through her second battle with breast cancer! I'd like to nominate my coworker and friend, Kay. December of last year, she was diagnosed, and she's currently just completed her third round of chemo. She still comes in to work everyday with a smile and encouragement for everyone else. Thinking of you during your difficult time. Manda seemed like such a strong and graceful presence. I love your blog. Our girls are very close in age! I would like to nominate my co-worker, Alesia. She is the Children's Ministry Director at a church. She was recently diagnosed with lymphoma & has just begun her first round of chemo. I know she would appreciate the blardigan during her upcoming treatments. Thank you for doing such an awesome thing for cancer patients! I would like to nominate my coworker, Alesia. She is the Children's Ministry Director at a church. She was recently diagnosed with lymphoma & has begun her first round of chemo. I know the blardigan would be blessing for future treatments. Thank you for doing such a awesome giveaway for cancer patients! I would like to nominate my co-worker Carol. She is a middle school teacher who is 38 and is newly diagnosed with breast cancer. She is continuing to teach while getting treatments. Thanks for blessing in Manda's memory. I wonderful lady in my church small group, just had surgery to remove breast cancer. This week she is doing a trial radiation and then will have chemotherapy as well. She has had the most encouraging spirit throughout this process. I would love to bless her! Want to nominate my fabulous mother. Just diagnosed with liver cancer which is incurable. She is from Central America. Now in the US for treatment. I would love to gift this to her. I think the blardigan is a brilliant, beautiful idea, and you are so right about the small, thoughtful gestures meaning so much. Praying for those that will receive these gifts. Please tell me how in the world you keep your house so clean while working and taking care of three kids! I work full-time and have two children and I have not been able to get our house back to clean and organized since I had my second back in October! A dear friend, Tracy Brown, was diagnosed with melanoma in January. She will go to MD Anderson for first round of radiation on Monday, March 20th. What a sweet surprise to receive a blardigan! I would like to nominate my grandmother (Monoo to us)! She is the most self-less person I know. She has multiple myeloma and I can't think of anyone more deserving. I want to nominate A. Wells. She's a young Mom and wife to an Air Force Pilot. She's undergoing treatment for breast cancer. Also if I can nominate one other awesome AF pilot wife, Bridgett Spillers. She has 3 beautiful kiddos and just finished treatment, but I know a blardigan would encourage her. Cancer is the worst. I'm so sad for Manda's family and friends. I'd like to nominate my mom, S, who has bravely battled breast cancer this past year and is thankfully recovering. It's been an incredibly tough year, and she has been such a trooper through chemotherapy, surgery and radiation. She never complains even though there have been many days when she's experiencing pain, feeling weak, getting a headache or feeling cold due to losing her hair. I'm so proud of her and hoping her recovery continues to go well, and this blardigan would be such an amazing source of love and encouragement for her. I'd like to nominate Wanda Hammond, who is currently battling breast cancer. Mrs. Hammond lost her daughter, Julie, one of my childhood friends, to a rare form of cancer at the age of only 32. Julie passed away on her mother's birthday, March 17, 2009. This would be a nice way to honor all of her love and support she gave her daughter before she passed and show her the love and support she has as Mrs. Hammond fights her own battle and faces another birtbday without her daughter. Thank you for sharing your dear friend's love of Jesus! I would like to nominate my friend, Kim Neal. She has ovarian cancer that has moved to her liver. She is a single mom whose 3 girls are in their early twenties. Kim tells her friends "I don't need your pity, I need your prayers!" I'd like to nominate my friend from college, Amy. She's a mom of 2 young kiddos who's fighting triple negative breast cancer. She is going through her 6th round of chemo right now. I would like to nominate a dear friend, Carmen, who is in the hospital right now going through intense radiation for a cancer that has now spread throughout her body. She has two boys and a husband who just underwent heart surgery in November. The blardigan would just be a warm comfort for her right now. Thank you for doing this. Love to all of you sweet girls for doing this! I would like to nominate my dear sister Amanda Smith. This is her 3rd time battling cancer. I would like to nominate a fellow teacher, Amanda Knox. I would like to nominate my good friend, Heather. She exemplifies a Proverbs 31 woman... much like I think your sweet Manda did. She is also a mom of two precious little ones, and is almost midway through treatment of Non-Hodgkin Lymphoma that was found this January. 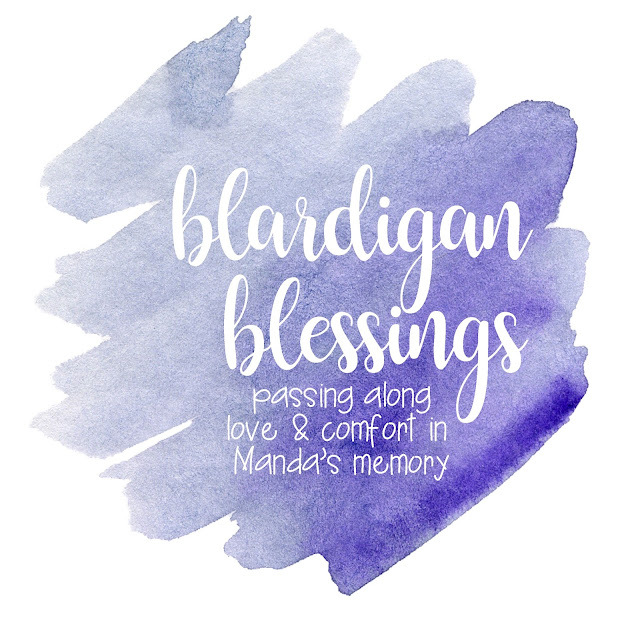 Our friend group prays for her without ceasing, have a meal train, and keep her spirits up with sweet surprises on her chemo days, notes, and play dates with her kids often, but a sweet gesture of what your blardigan gift represents would mean so very much. Thank you for thinking of all those who are undergoing treatment and carrying on Manda's spirit perfectly. What a sweet idea with the blardigans. Your weekend looked like a lot of fun! So much family time which I love! GG trying those pj's in the mirror is just adorable! Is that unicorn from Nordstrom? I'm so sorry about your friend, Manda, and know your community of friends will be there for her young family going forward. I would like to nominate my mother, Rita, as she battles lung cancer. She's a non-smoker, and so we were shocked when she received her diagnosis after testing done once she noticed that she became short of breath fairly often. She's been the quiet rock of our family and is stoic in her fight. She's also of a generation that doesn't like to talk about personal battles publicly, and so my brother and I are trying to gently have some very serious conversations with her and my father about what the future holds. My mom is fighter. She is currently battling her second round of breast cancer. She was diagnosed in June 2005 and then her cancer returned August 2015. We were all shocked as she had been cancer free for 10 years. She knits prayer shawls for others going through chemo treatments and prays for them as she completes each stitch. Then she takes them to the hospital to be given to anyone in need of prayer and uplifting during their own battles. I would like to nominate her so that she might be able to receive and feel the support from others she doesn't even know, just as she had done and continues to do for so many. Her name is Nancy Horn. What a thoughtful way to honor your friend's memory... I know just the friend of mine who could use this comfort!